Beautiful sunset color is critical to great photographs. It’s what sets your image apart from so many other others. I believe it’s so important that I dedicated an entire chapter of my blending course to getting great color. There are many tricks for getting great color, but one of my favorites is to couple an adjustment layer with BlendIf. It’s quick, leaves your options open to easily make changes later, and it keeps your files smaller than using layer masks. Combined with the right adjustment layers, BlendIf can create gorgeous sunsets. In this tutorial, you’ll see several examples of how you can use BlendIf with solid color layers, HSL, contrast-enhancing curves, and brightness layers to extract more color and detail from this sunset cityscape. Part 1 shows the workflow to process the image in Photoshop. Part 2 then explores why using the color-channels in BlendIf is so powerful for enhancing sunrises and sunset. Adjust the slider for the “underlying” layer. Do not use “this” layer when applying BlendIf to adjustment layers. Once you find the approximate shadow or highlight slider positions, hold <alt/option> to split the sliders and create a more natural result. To target sunset colors, try bringing up the red shadow slider (instead of using the gray sliders). If you want to further target sunset colors, try bringing down the blue highlights slider. The added benefit here is smaller and this is something you can safely skip, but it’s a nice trick when you want to really tweak the results. Be sure to also see Color Grading with BlendIf. The walls in my house are a subtle shade of green. “Hampshire Gray,” I think it’s called. Whatever it is, it’s starting to feel a little dark and dated. When we have it redone, our painters will have to protect the windows with removable blue tape before they start painting. They’re professionals, but they still need this tape to avoid accidentally painting on the glass. I suppose they could do it without the tape, but it’d probably take several extra weeks and they’d probably still make a few mistakes. So no matter how good of an artist you are, it is important to have tools to work more precisely and more quickly. In Photoshop, the equivalent of using blue masking tape is “selections”. These act like a “stencil” to control what you can affect with the various tools in Photoshop. When you have an active selection, you can only use Photoshop’s tools (such as the paint brush) inside that selection. This can help you change a red car to green, without changing the color of the bumper. Or whiten someone’s teeth, without affecting their lips. Of course, there are always many ways to do things in Photoshop and you can use layers and masks instead of selections to make those same changes. In fact, masks are often the best way to make those changes because you can typically revise or undo adjustments made with layers and masks. But it isn’t an either/or situation, both selections and masks are critical to producing great images with Photoshop and it is important to understand each of their roles. Masks control which pixels you can see, while selections control which pixels you can change. Masks conceal or reveal various parts of your layers. Selections affect which pixels you can affect with a tool, warp, or filter. And because masks are just grayscale images, you can also use selections to help create or refine your masks. So even if you use adjustment layers instead of brushes or other tools, it’s important to be skilled with selections. In the following video, you’ll see these concepts in action as you get a brief overview of every selection tool available in Photoshop. Photoshop offers many tools for making selections. They can be a little difficult to discover, as they aren’t all in one place. They are located in the tool bar, various menus, in the layers and channels panels, and available via shortcut keys. To help you find them, I’ve listed where to find each next to its description. Marquee selections (Found in the toolbar; shortcut: <M> or <shift><M>). This allows you to create selections which are rectangular and circular in shape. That may sound simple, but can be quite useful for creating vignettes, general selections, or revising selections by using the add/subtract/intersect commands mentioned below. This is a “dumb” tool which completely ignores the content of your image. Lasso selections (Found in the toolbar;shortcut: <L> or <shift><L>). The general idea is that you draw a freehand selection. The polygonal version allows you to draw with a series of connected lines, and the magnetic version tries to help snap the selection to edges. The use of this tool is often similar to the marquee selections, but with much more control over the shape of the selection. This is a “dumb” tool which also ignores the content of your image. Magic wand (Found in the toolbar;shortcut: <W> or <shift><W>). This tool allows you to select pixels which are similar to whatever you click on. This is very useful to quickly select things like a blue sky. However, this tool creates all or nothing selections, which means that the transitions are very harsh. Quick Select (Found in the toolbar;shortcut: <W> or <shift><W>). This tool is somewhat similar to the Magic Wand, but you click and drag to help define the selection. The Magic Wand is great for subjects which may be broken up (such as a blue sky obscured by tree leaves), whereas the Quick Select is often simpler for targeting continuous subjects (such as a continuous sky). Taking things a step further, selections aren’t quite as simple as blue masking tape. The selection tools mentioned above either create selections which are 0% or 100% for a given pixel. But the more advanced options below can be partially selected from 1-99% as well. These allow for much more natural selections and higher quality work. Refine Edge (Found under the Select menu as “Select and Mask,” or as “Refine Edge” in older versions of Photoshop). This tool helps to soften the improve the edges of your selection by analyzing the image content and is a great way to address edge issues with the Magic Wand and Quick Select tools. Color Range (Found under Selection/Color Range). 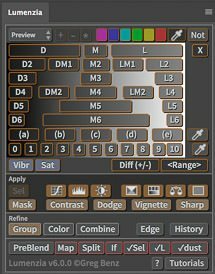 This tool helps target pixels of similar tone or color. But unlike the Magic Wand or Quick Select tools, it is able to create partial selections. This allows for more natural selections and higher quality work. From Channels/Masks (available in the channels panel under Window/Channels: look for the “load channel as selection” icon at the bottom of the panel or <ctrl/cmd>-click on any thumbnail in the channels panel. Or you may <ctrl/cmd>-click on any layer mask in the layers panel). This creates “luminosity selections”, or selections based on the brightness of the image. This is an advanced technique, which I cover in great detail on my luminosity masking page, newsletter tutorials, and in my exposure blending course. From Transparency (available by <ctrl/cmd>-clicking on any image thumbnail in the layers panel). If you have a normal layer which covers the entire image, this is the same as selecting everything. But if the layer has some transparency, can be used to target just the pixels in the layer. This is most useful when targeting areas dodged and burned on a transparent layer. For the most part, it is just important to be aware of this because if you -click on the image thumbnail, you will probably see a selection around the image when you meant to load the layer mask or channel as a luminosity selection instead. In other words, you’ll probably run into this by accident at some point if you’re using luminosity selections. Loading from transparency only considers the transparency of the pixels, not their luminosity. Photoshop includes various other tools to work with selections, which are often used to combine simple selections into more complex and useful ones. Deselect (shortcut: <cmd>-D). This discards your selection, so that you can once again change any pixel. Select All (shortcut: <ctrl/cmd>-A). This is commonly used to select the entire image so that you can copy and paste it. Expand/Contract/Feather (Found under Select/Modify). Feathering is an especially useful option to help transition more smoothly from areas which are selected to those which are not. Expanding and contracting can be helpful to refine a Quick Select at the edges. Add (shortcut: <shift>). Combining selections allows for more complex selections. Adding via marquee or lasso is a great way to fill in any holes in the middle of your selection. Subtract (shortcut: <alt/option>). Subtracting via marquee or lasso is a great way to remove parts of your selection you don’t want. Intersect (shortcut: <shift><alt/option>). Intersecting keeps areas which are common to two selections. Intersecting with a lasso is a great way to keep just a portion of an existing selection. Hide Marching Ants or “Extras” (shortcut: <ctrl/cmd>-H). This allows you to hide the “marching ants” that are meant to show a selection, as the ants can be very distracting. This is just an overview of the tools that ship with Photoshop. There are many 3rd party options to help create and use selections, such as my luminosity masking panel Lumenzia. Version 7 of the Lumenzia luminosity masking panel for Photoshop is now available as a free upgrade for all customers. This is the the most ambition update since v1, with over 160 new features, updates, and bug fixes in total. The major themes in v7 are speed and interactivity. It’s never been easier to create the perfect luminosity mask or selection to make beautiful photos. And the updates have been designed to avoid changing any existing workflows, so you can jump right in. Fast previews. This dramatically speeds up the creation of the temporary orange and red layers under many common conditions (up to 4-8X faster on typical files, or up to 20X on extremely large files). Highlight blown or nearly blown highlights and shadows by <alt/option>-clicking “Map”. Load any gray or transparent dodge/burn layer as a selection, so that you can further refine your results (such as by applying a contrast curve to only the areas which were dodged and burned). And so much more (>160 enhancements total). See the release notes for a full list of all changes. ** Note for CS6 users: While v7 includes >100 enhancements for CS6, you will see that several new interface items which require CC (such as the sliders). This are unfortunately due to limitations of the nearly 7-year old CS6 platform. Differences are primarily in appearance or workflow. Functional capabilities generally remain nearly the same (the new color model is only available for CC however). Photoshop and Lightroom have an endless choice of tools for enhancing color in your photos. In the past, I’ve written tutorials on how to use Selective Color, Camera Calibration, HSL, and BlendIf. In this tutorial, I want to cover and old and often overlooked tool in Photoshop, Replace Color. Enhancing de saturated colors: Selective Color and HSL are great tools to enhancing color, but they can’t target colors which are too de-saturated. Replace Color can much more easily target the key areas to add saturation. Increase saturation of bright colors: When the brightness (lightness) of a pixel is too high, increasing saturation may not increase perceived color at all. This is often an issue with bright colorful skies. The way to increase color is to reduce lightness, rather than increase saturation. Selective Color tends not to work in this situation, and HSL can be difficult to target precisely in this situation. So Replace Color becomes a great option. Dodging and burning: It can be difficult to independently control changes in color and tone when using traditional dodge and burn techniques. The beauty of Replace Color is that it gives you independent control over hue, saturation, and lightness while targeting highlights or shadows in your image. Of course, you can also use it for its intended purpose, to replace one color with another in your image. However, I prefer changing colors in LAB.When you make such a dramatic change in hue on a detailed object (vs a sky), there are some little things that may go wrong and be hard to notice initially when using Replace Color. There are also some good reasons why Replace Color is not widely used. It does not support a non-destructive workflow, because it cannot be used as an adjustment layer nor on a Smart Object. So Replace Color should typically be used either very early or very late in your workflow. And if another tool can get the job done just as well and work non-destructively, that’s usually the best choice. But when you run into one of the scenarios above, it’s a great option to consider. Replace Color works on a single layer, so create a flattened copy of your image. You can do this by clicking <ctrl/cmd><alt/option><shift>-E to create a “Stamp Visible” layer. Increase the saturation slider significantly to the right (or make some other dramatic change in Hue, Saturation, and Lightness). The result will look overdone, but you’ll be able to clearly see where in the image you are making changes. Make sure “localized color clusters” is checked. Most of the time, this is the best option. This keeps your adjustments more isolated to the areas you click, which is generally what you need when using this tool. You can always toggle it off and on to compare later. Now use the picker tool to click on your main target. Adjust the fuzziness to select more or less of the colors similar to what you initially clicked on. You can hold <shift> or use the picker with the + sign to manually add to the selection with additional clicks. [The subtract (-) option does not work as you would expect and I recommend not using it at this time]. Now that you have dialed in the targeted, adjust the hue, saturation, and lightness to get the desired effect. Continue to iterate your targeting and HSL values as needed.